Subject(s): Church development - New, Natural Church Development, and Religious. The Natural Church Development process involves assessing and strengthening eight Quality Characteristics in the local church. NCD International is developing eight Discipleship Resource books, one to address each of these areas. Two of these books are currently available–this one which corresponds to the Quality Characteristic of Loving Relationships and another which which corresponds to the quality of Gift-Based Ministry. This book focuses on the three fundamental dimensions of God’s love that every believer can reflect in his or her life: justice, truth and grace. Depending on your starting point, your personal growth path may be very different to someone else’s. 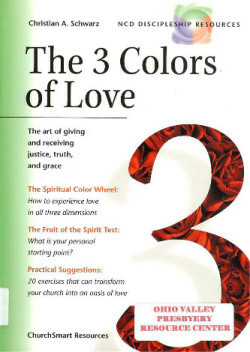 The 3 Colors of Love offers practical tools to help you identify your starting point and experience the revolutionary power of God’s unconventional love in your life.